A holiday favorite at my house, this is the casserole with minute rice, Velveeta cheese, and broccoli. This is the recipe that my Grandmother used to make all of the time. Who doesn’t love broccoli and rice casserole? This is a classic holiday dish. We had this dish every Easter, Thanksgiving, and Christmas. I know I have had this particular dish at most every holiday since I was a small child. Easy to prepare and it will have people who hate to eat broccoli enjoying this dish. I will even serve this casserole when I am going somewhere for a holiday meal. It is one of those dishes like the Green Bean Casserole that is a staple at every holiday meal. I like to serve this one because when I bring the dish home it is always empty. This version of the recipe uses Minute Rice to help speed up the cooking time. So you can cook this one in a quick jiffy. this recipe is simple and tried and true. You can substitute long grain rice after it is cooked in this recipe if you don’t want to use a quick cooking rice. This recipe is by Virginia McDowell. Jefferson City, Mo. 1975. 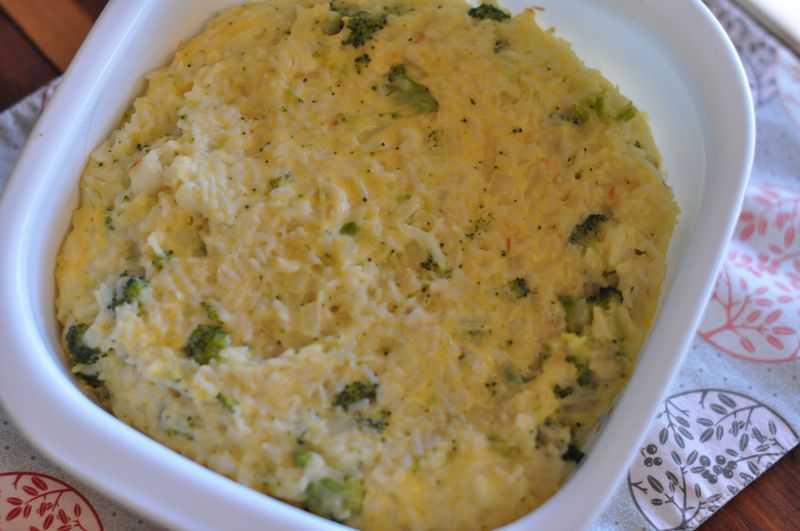 Broccoli and Rice Casserole is a side dish everyone loves. Chop onion fine, and cook in butter until the onions are transparent. In a small pot melt together the can of soup, water, milk, and Velveeta cheese. Then mix everything together in a medium sized bowl and then spoon into a 2 quart casserole dish and bake for 45 minutes at 350 degrees. I know it says frozen broccoli can be used. Do you just add it to the mixture still frozen? Or do i steam first? I would let it thaw a bit first, then I would just add it into the mix. I am making this for Thanksgiving side dish and I have a huge family. If I double the recipe, how long do I cook it in the oven for? I would add about 10 to 15 minutes additional time. I would add another 10 minutes to the cooking time. I made this for the first time Monday June 30. It is supposed to serve 10. It did not. My family loved it so much they devoured it. I made it for the second and third time on Wednesday July 2. I fixed one for dinner. It was gone. Just gone. I put the second one in the stove while we were eating. It was going to be the late night ‘snack’ , It lasted until about 8. It is gone, They love it. I made the recipe as directed, Excellent. One time I added crushed Ritz and butter to 1/2 of the casserole, It was a nice touch. Wow, sounds like your family really enjoyed this recipe. I have always had great luck with this dish. I like the addition of the Ritz crackers, it sounds perfect. I appreciate you dropping by and giving this recipe a try. Do you melt the velveeta cheese before you put the casserole in to bake? I’ve tried this recipe numerous of times and it turns out delicious everytime! Thanks for the recipe! I am so glad that recipe turns out well for you each time. I love recipes that I can rely upon!! From a McDowell in Texas. I don’t care for velveeta cheese. Is there a substitution? I might suggest using a store brand “velveeta” they don’t taste quite like Velveeta, but they do a good job of melting. Otherwise I would use a mexican blend of cheese, those melt nicely. You can also use just plain American cheese.